– Preheat oven into 375 F.
– In a medium, heavy bottomed pot combine polenta, vegetable broth, 1 tablespoon olive oil, 1/2 teaspoon salt, thyme, oregano, rosemary and basil. – Cook over medium low heat stirring continuously with a whisk for about 8-10 minutes or until polenta is very thick. – Immediately spoon polenta onto (2) 10X15 baking sheets forming 2.5 inch round circles and lightly flattening with spoon. – Let polenta sit for 20 minutes or place in refrigerator to firm up before baking. – In a medium frying pan combine 3 tablespoons olive oil, 1 very large thinly sliced onion, and 2 good pinches of sea salt. – Sauté over low heat stirring every 5-7 minutes until brown and caramelized (could take up to one hour). The trick to the most amazing caramelized onions is to cook them as slowly as possible and patience TOTALLY pays off! – Prepare rainbow chard by separating the stems of the chard from the leaves. Discard stems. Thoroughly wash and dry leaves. – Rough chops leaves until no large pieces remain. – In a medium frying pan combine chard, crushed garlic and 1 tablespoon olive oil. – Sprinkle with sea salt and cook over med-low heat stirring frequently. 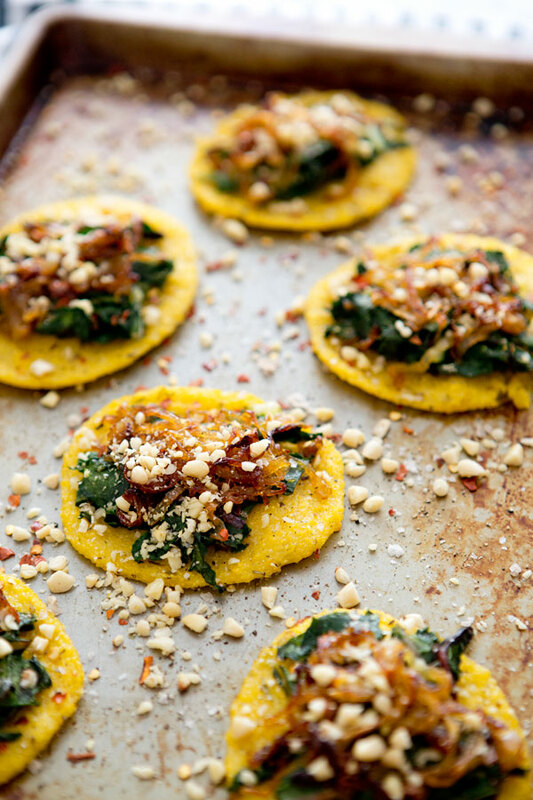 – Spoon 1/2 tablespoon pesto onto each pre-baked pizza crust, top with cooked chard and caramelized onions. – Cook for an additional 10 minutes, or until crust is crunchy! – Sprinkle with chopped pine nuts, fresh cracked pepper, finishing salt and red pepper flakes to your preference. – Serve using a thin spatula to remove pizzas from baking sheet. Let sit cool for a minute or two before serving. * If onions begin to stick add additional oil as needed. * Be careful! Polenta splatters when cooking! * Do not oil baking sheets, this will keep the crusts from crisping as much as you’d like. LOVE polenta pizzas!! These are absolutely gorgeous! sarah these look so delicious! 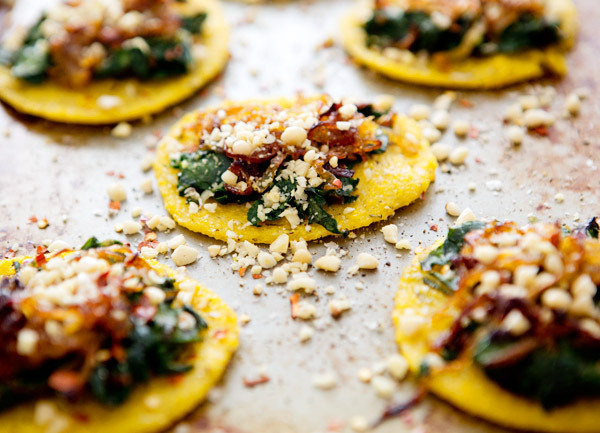 We love polenta pizzas. This recipe sound easy and delicious. Thanks for sharking! What a great idea. I pinned it, not to forget. Love these gluten/dairy free mini pizzas. Great for sharing! WOW!! these look great. thanks for sharing!! Im making these tonight! Cant wait! 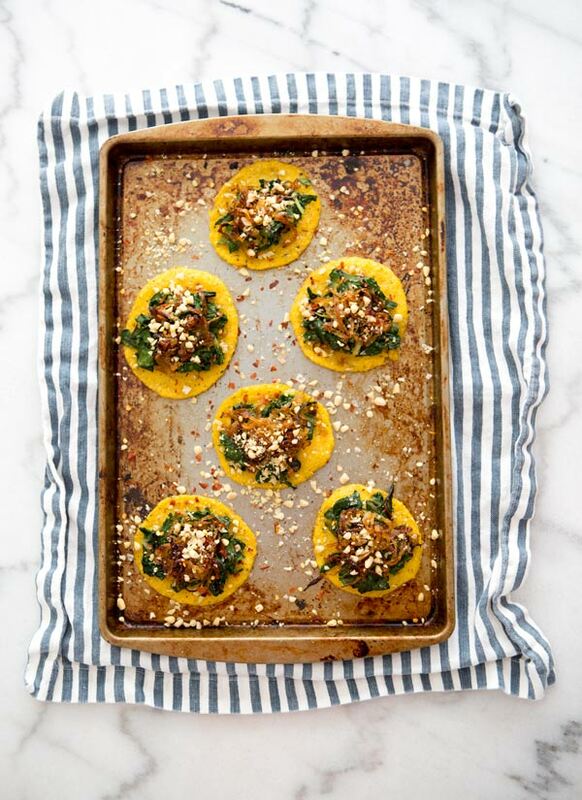 These look great, but I am a little confused… where your recipe says "polenta", do you mean the kind that comes in a log shaped package & is found in the refrigerated section by the fresh pasta? Or are we talking about cornmeal? Thanks in advance for the clarification! 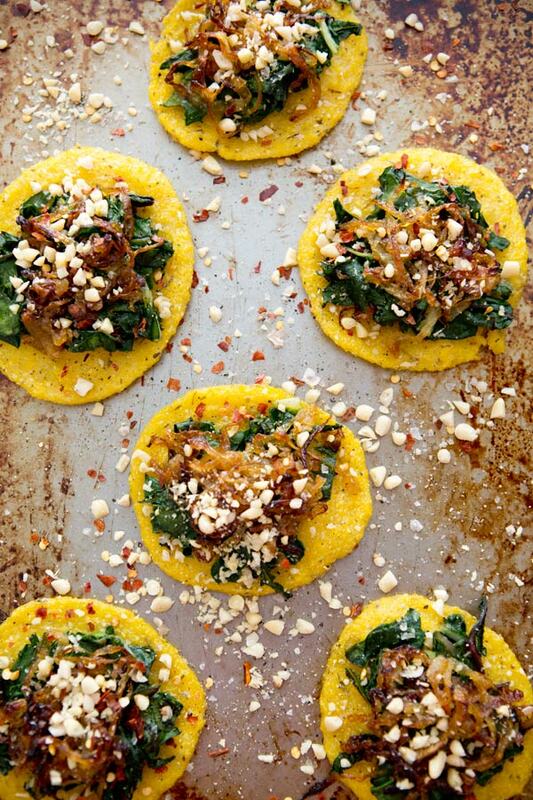 Wow, that's the only word I could think of as I'm drooling over these delicious looking polenta pizzas. I'll definitely give it a try. Thanks for sharing. Question… can I use an already made polenta for this? We are always short on time and thought to ask just in case. I have a question about the polenta… Your recipe sounds and looks absolutely delicious so I went hunting for polenta at my grocery store. I was pretty excited to have found it but it seems a little different than what you sort of describe. It came in a shrink wrapped tube and seems sort of rubbery and wet… Can I still use this type? Would I need to cook it with the broth or should I just try to flatten it out and move onto the chilling and baking stage? I know I could just go ahead and try it but I’m just not sure… Thanks! I think she is referring to uncooked polenta, that comes in grain form. The one you picked sounds pre (or par) cooked? Try for the uncooked grains, so so so much better from scratch. But otherwise I would cut discs and flatten out for the refrigeration stage. Well I finally got around to making these with my tube of polenta and they were fantastic!! So yummy! I just wish I had cut the polenta lengthwise rather than in little rounds – I hoped I was going to be able to spread them out a little but you can’t. You just have to go with the shape you cut it into. 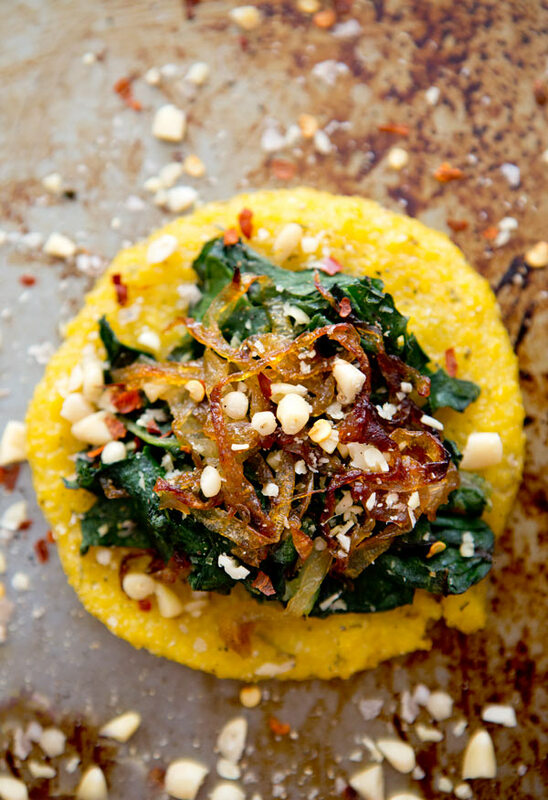 My eyes have now been opened to the yumminess of polenta and I’m thinking of all kinds of delicious toppings to try! 😉 We have been working on cutting wheat out of our diet and I think this is the alternative I’ve been looking for. I made these tonight & they were absolutely delicious !! I didn’t need to change a thing. Thank you !! in the cruel approach to intentionally allow it to be suffer. way back. They seek their food in secret, evading the observation of humans. Having pests at your residence is very problematic and requirements immediate pest management. advanced strategy of hair extension, Advance Hair Extensions System. on a weekly basis to make them more efficient. definitely an indicator of underground springs. Subsequently when he takes it well the property he could be exterminating the snake. for taking care from the valuable properties and products. it is best to remember that in pest management, prevention is preferable to cure. If you are facing pest problem then it is thetime to contact – Pest Control Services. also be serviced on a weekly basis to make them more efficient.